The Periodic Table of the Elements- we all probably studied it in school. I remember trying to memorize the symbols for the elements. AU for gold, AG for silver, PB for lead and so on. Now these can be nice to know if you’re taking one of those random intelligence tests, but hardly exciting material. I wish now that we had studied the periodic table using Gray’s fascinating book Elements: a Visual Exploration of Every Known Atom in the Universe. (Of course, it wasn’t even written back then.) I’ve heard a lot about this book, but only recently decided to see if it was available from the local library. Sure enough, it was, along with Gray’s book on molecules. The book did not disappoint: it’s poetic, it’s witty, and best of all it’s captivating. Soon your family will be waiting in line to read it (mine was). I think they just might. If you, as a parent, pick it up and start throwing out fascinating bits of information like the following, you just might be surprised. Did you know that sodium, when thrown into water, “rapidly generates hydrogen gas, which seconds later ignites with a tremendous bang, throwing flaming sodium in all directions”? Or that chlorine was used in WWI as a poison gas, but was slowly discontinued when experience showed that roughly the same number of soldiers were dying on both sides regardless of who set off the gas? And yet these two elements combined, produce common table salt. Or did you know that the average children’s toy today contains more computing power than the Apollo moon rocket (this is found under silicon the 14th element)? I’d love to tell you how arsenic used to be used as a paint pigment, or the radioactive drinks they used to sell to promote health (and the tragic results that followed), or the myth behind diamonds. The list could go on, but you’ll just have to get your hands on a copy yourself. I wish I could explain in a few paragraphs how a laser works, I really do. But it takes a couple of years of calculus and a semester or two of physics to even ask the question properly. Once you get there, the answer is absolutely worth it, deep and beautiful and so real you can taste it. This and the many answers like it are among the main reasons to study higher mathematics. Math is the language in which the secrets of the universe are written, and through its understanding comes enlightenment. So do your homework, OK? It’s worth the journey. Our time with this book ran out at the library so it’s on our wishlist on Amazon. Elements: A Visual Exploration of Every Known Atom in the Universe by Theodore Gray would make a great gift for a budding scientist, or a fascinating addition to a science curriculum. You’ll be surprised at all you will learn without even trying. My 10 year old LOVES this book! Such a fun way to learn the elements. Yes, it is, isn’t it? I love when we can find great books like this to make learning fun. What a beautiful resource! 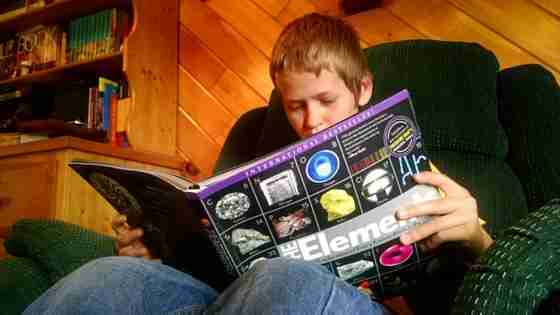 I have always loved the Periodic Table, but this book brings it to life! It really does! Thanks for stopping by! This looks like such a great book! Thanks for sharing! great books. my kids love reading books, specially astronomic books, i’m so proud of them. Thank you! I’m glad your kids enjoy reading! Hey, Suzanna, I will have to check this book out. It sounds fascinating….love the quote. Thanks for all the time you put into this blog. I am often inspired even if I don’t take the time to comment.